Electron and ion microprobe data on two samples of welshite from the type locality of Langban, Sweden, gave analytical totals of 99.38-99.57 wt.% and BeO contents of 4.82-5.11 wt.%, corresponding to 1.692-1.773 Be/20 O. Mossbauer and optical spectra of one of these samples gave Fe-[iv](3+)/Sigma Fe = 0.91, Fe-[iv](2+)/Sigma Fe = 0.09, and no evidence of Mn3+. The resulting formula for this sample is Ca2Mg3.8Mn0.62+Fe0.12+Sb1.55+O2[Si2.8Be1.7Fe0.653+Al0.7As0.17O18], and that for the second sample, Ca2Mg3.8Mn0.12+Fe0.12+F0.83+Sb1.25+O2[Si2.8Be1.8F0.653+Al0.25As0.25O18], is related by the substitution involving tetrahedral and octahedral sites: 0.59([vi,iv])(Fe,Al)(3+) approximate to 0.42([vi])(Mg,Mn,Fe)(2+) + 0.21(Sb-[vi],As-[iv])(5+), i.e. 3([vi,iv]) M3+ = 2([vi])M(2+) + M-[vi,iv](5+). WelShite is distinctive among aenigmatite-group minerals in the high proportion of Fe 3+ in tetrahedral coordination and is unique in its Be content, substantially exceeding 1Be per formula unit. 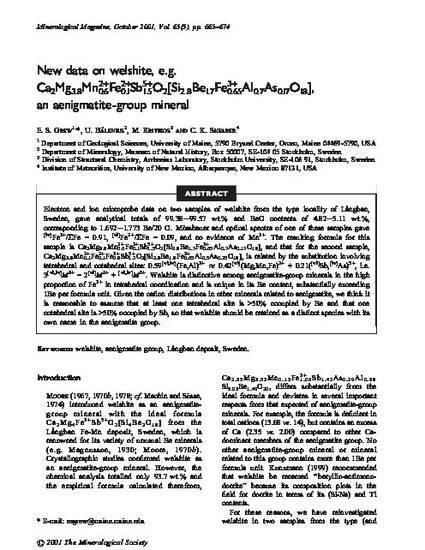 Given the cation distributions in other minerals related to aenigmatite, we think it is reasonable to assume that at least one tetrahedral site is >50% occupied by Be and that one octahedral site is >50% occupied by Sb, so that welshite should be retained as a distinct species with its own name in the aenigmatite group. Grew, ES, Halenius, U, Kritikos, M, and Shearer, CK, 2001, New Data on Welshite, E.G. Ca2Mg3.8Mn0.62+Fe0.12+Sb1.55+O2[Si2.8Be1.7Fe0.653+Al0.7As0.17O18], an Aenigmatite-Group Mineral: Mineralogical Magazine, v. 65, p. 665-674.